When you are using Java Flight Recorder (JFR), the JFR will use an event settings file to check which event types to record. By default in JFR, there are two settings, "default" and "profile". The default setting is recommended for Continuous Recordings as it has very low overhead (typically less than 1% overhead). The profile setting has more events and useful when profiling the application. 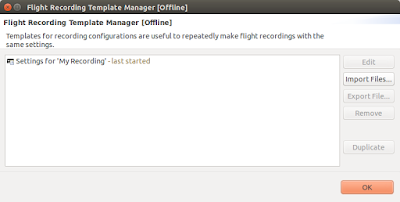 As mentioned in my previous blog post regarding Java Flight Recorder Continuous Recordings, we use following arguments to do a Continuous Recording.